When you live in a place steeped in riches and history, you can often feel a need to reflect this history in everything you do. Cirencester is one, such town with a great history and visual reminders of this wherever you travel in the town, including the Baptist church and The Fleece. It’s therefore reassuring to know that you can do your bit to reflect this rich history when you are holding a modern celebration such as a birthday party, anniversary or wedding by choosing one of the most historic and traditional meals there is: hog roast. An event with this form of cooking will really will reflect the town’s history like no other! Planning an event may seem like a daunting task, but in reality, it’s a lot simpler than you may think. What makes things even easier is the fact that caterers can take away all the hard work and help you deliver a fantastic event without the need to worry about catering the event yourself. So, what sort of hog roast event do you have in mind? 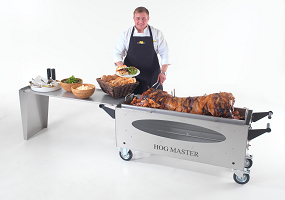 Not that it matters too much, because hog roast is one of the most versatile catering solutions available. It is a really great option if you are planning a garden party. A hog roast makes some of best tasting pork rolls you will ever taste, in fact it is brilliant for outdoor catering. The children can have the run of the garden and tuck in to some great food. Cider and pork rolls for the adults is simply a marriage made in heaven (or the garden). Of course, the British weather is not the same as the south of France, so you may choose a slightly safer option and hire an indoor venue such as a church hall or specialist event room. Your food can be served both inside, as well as outside. And how would you like your meat? You can of course stick with rolls and sauces but hog roast can be a little more upmarket if that is what you would like? Hog roast can be professionally served as carved meat with all the trimmings for your guests, making it look like a plate of the finest meat from a top restaurant. Finest meat is what it is of course, but without the top restaurant prices! And that’s where hog roast really comes into its own because this fine food, once the feast of kings and queens, is remarkably good value. Take a look at the whole pig on the roasting machine and then think that over one hundred people can be fed from just the one pig! It’s an incredible number but then again, a hog roast is an incredible food. Your guests will be mightily impressed with every aspect of the feast, from the visuals of the cooking process to the delicious flavours of the hog roast meat. Put a little history into your event by choosing a Cirencester hog roast caterer. With Cirencester being in the heart of the Cotswolds with a central position, it was the second largest place in Britain during the Roman times and was the second most important place and now because of this with it being an extremely popular regional attraction. At your event, we take all the worries away, giving you peace of mind and a laid back day, knowing the professionals are taking care of all of the catering for you. With a population of eighteen thousand people claims the title ‘the capital of the Cotswolds’ It lies within the dips of the breath taking Cotswold hills for catering in the town it has something for everyone, something to suit everyone’s needs and a quick fact for you all would be that west of the town. Cirencester lays the grounds where Royal Prince Harry and William have played Polo. With over 3000 acres of land and the park being open to visitors on most days to walk in a relaxed environment the entrance is free of charge and even children and dogs are welcome to take a walk around the beautiful park. Cirencester is a elegant town full of tradition from the past thriving wool trade and the award winning Corinium museum which holds over one and a half million historical objects is very much recommended if you are visiting the town as it is full of Roman history and is a great day out. Yearly in Cirencester a family fun day takes place in July in which a diverse range of catering takes place although the range is diverse nothing makes a head turn more than seeing a hog roasting away. Hog roasts are more popular than ever it still seems to fascinate everyone that comes across one, which is why we love hog roast catering so much.